By far and away my favourite story in the entire Dan Dare 2000AD series. This strip is definitely one of the darkest in the series and also marks arguably the first time Dan Dare ventured into fantasy as well as genuine horror too. Journeying through the forbidden zone Dan soon stumbles upon a strange planet with a single heart shaped continent. Its inhabitants who contact them are beautiful humanoids who dress like ancient Romans. They welcome Dan and his team to their planet but ask that they dispose of their weapons first as they have none on their planet. Dan is somewhat reluctant but nevertheless agrees to their terms. His team however are also distrustful of these supposedly peaceful aliens and two of them continue to carry knifes. When the aliens discover this they are not angry but simply ask that they dispose of them which they are forced to agree to. The aliens treat Dan and his team to a huge feast and a party. The two members who carried weapons soon leave with two young women. Dan worried that they might get into trouble follows them and later finds them dead, with their hearts torn out. Dan discovers the awful truth. The inhabitants of this world are Vampires! They lure any ship that passes by down to the planet and then tear them apart with their fangs. The reason they don’t have any weapons is due to their Vampiric strength and razor sharp fangs they don’t need them! Dan goes to try and warn his men, but finds that many of them have been drugged. With the Vampires ready to rip them limb from limb Dan intervenes and manages to rouse his men. A fight breaks out and many of Dan’s men are killed horribly by the monsters. Nevertheless they manage to make their way back to ship and narrowly escape the Vampires who pursue them in their own space ships. After getting clear of the planet Dan quips that nobody is going to be heart broken to say goodbye to this world. Dan discovers the awful truth about the creatures of this planet! This story I think demonstrates the edge that the 70’s Dan Dare stories had over the classic strips from the 50’s and 60’s. The 50’s and 60’s strips were definitely more culturally significant and ground breaking and had longer more complex stories, but the 70’s strips were far wilder and more batshit mental! I honestly could never have imagined a story like this in the older Dan Dare series. A planet of heart eating Vampires would have been too extreme alongside the more straight forward sci fi adventures of the original. When I first read this I was expecting these guys to be in league with the Mekon or something typical like that. When Dan discovered them ripping two men’s hearts out with their fangs it was quite a shock. The Vampires in this seem to be the real deal which therefore possibly marks the first time Dan Dare ventured into actual fantasy territory rather than Science Fiction, something the series would later do more prominently after the Lost Worlds story arc. This story is like a horror movie. In places its genuinely frightening and the art work for the Vampires really makes them look monstrous. Their leader when his true form is revealed is almost like a devil with his massive fangs and bright red skin, snarling at Dan and his crew that he will have their hearts, he truly does seem like a vicious, sadistic monster. Overall whilst this might not be the longest or the most complex Dan Dare story I’d still rank this as my favourite simply because its just got such an offbeat and crazy premise and it really does seem like a horror movie instead of a Dan Dare comic. I wonder how the main characters from Blake’s 7 would have coped on the Vampire planet? 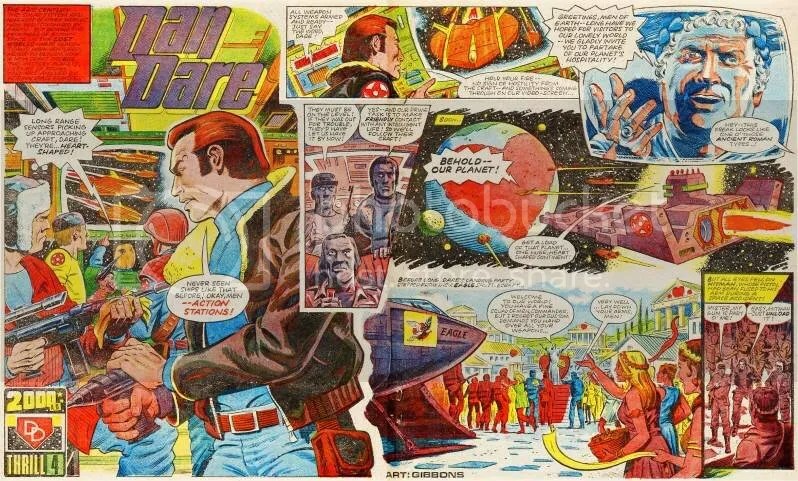 Since I think that Blake’s 7 and Dan Dare take place in the same universe (and you should too!) then the crew of Scorpio must have just missed it as they clearly travelled into the area of the lost worlds as they visited the Sand planet that Dan landed on. Servalan also visited the Sand planet too remember. At the end of Sand however when they all leave the sand world they head back the way out of the Lost Worlds space and back home. If only they had gone just a bit further out then they would have ended up on this planet. I reckon Avon would have found a way to escape from the Vampires. He is Avon after all. He’s probably have kicked Tarrant into them and fled. Villa wouldn’t have made it out alive. He’d have got drunk, given in instantly to the lure of one of the female Vampires and had his heart torn out. If Servalan meanwhile had arrived on this planet well I think she would have been converted by the Vampires. After all she’d fit right in with them wouldn’t she? Imagine that if Servalan became a Vampire and went back to the Federation. She could rule over it forever! Also she could turn other members of the empire into Vampires. Hell the whole Federation could have become a blood empire. All made up Vampires taking over planets to herd their population up like cattle so that they could drain their blood on mass and turning the strongest and most intelligent members of each species into Vampires. Pretty terrifying thought. Its probably just as well that Scorpio and Servalan gave this planet a miss! This strip bares some similarities to the 1960’s horror film The Fearless Vampire Killers. The final scene of the Vampires chasing them almost recreates the ending of that film. The Fearless Vampire Killers was most likely an influence on this strip. 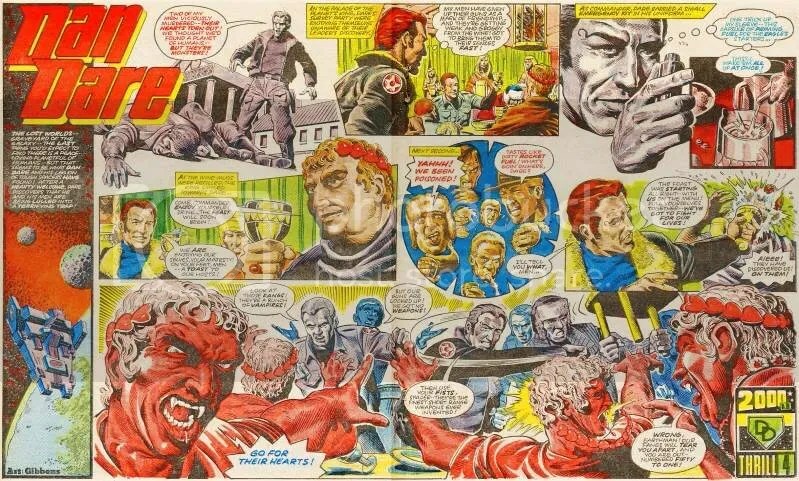 If Dan Dare and Doctor Who do share the same canon then it is possible that this planet was visited by the Great Vampires who turned its population. These Vampires unlike those in State of Decay would have survived their masters death as it was shown in Spin off material that some lesser Vampires were able to live on after the Great Vampires demise.